Individual cells can be segmented using confocal datasets and rendered in three dimensions. Whole tissues can be reconstructed from the component cells - as shown here for a root meristem within an Arabidopsis embryo. Outer cells can be made transparent or discarded to reveal inner features, and the arrangements of cells can be interactively visualised in three dimensions. 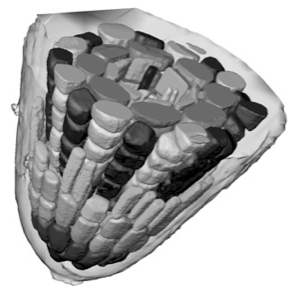 3D visualisation can show conserved cell arrangements that are not evident from 2D sections. We can routinely reconstruct the cellular structure of entire meristems for various experiments. The large confocal data files, up to 200MB in size, allow excavation of the data, production of sections in arbitrary planes, and rendering of surface features.We also use computer visualisation methods, borrowed from the medical imaging field, to reduce large data sets to a simple description of the 3D shapes and arrangement of cells in a meristem. Advanced 3D segmentation methods allow the definition of individual cell shapes within a dataset. 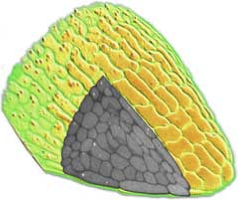 A segmented volume can be used to compute a three dimensional surface or solid, to allow simple and accurate visualisation of the dimensions, shapes and relative arrangements of cells within optically sectioned meristems. These same methods are being used to analyse meristems that have been genetically perturbed by GAL4 targeted cell ablation or misexpression. The precise arrangements of cells within intact plant tissues can be visualised. For example, fluorescently labelled cell walls can be subjected to high resolution optical sectioning using confocal microscopy techniques. Individual cells within these datasets can be segmented using manual seeding, thresholding and dilation techniques. 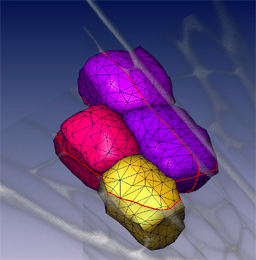 Cell surface geometry can then be described using a “marching cubes” algorithm, and smoothed and displayed in AMIRA. In this way a complete picture of cell arrangements can be built up, cell-by-cell. However, this approach is slow, and depends on the availability of clean datasets with high S/N and even distribution of the label. In order to improve speed and reliability of the segmentation procedure, we are writing custom software. The cell volumes that we wish to segment are completely bounded by a labeled cell wall with regular features. The walls are flattened against the walls of abutting cells and are rounded at the cell vertices. It would be useful to take advantage of these regular features and use them to constrain the segmentation process. The major problem with the segmentation techniques that we currently use is that “blind” 3D dilation and thresholding is very sensitive to flaws in the data, resulting in constant bleeding and selection of unwanted extra regions. (i) We can use 3 orthogonal views to select 2D cross-sections of a particular cell (this can be done interactively in Amira). These cross-sections can then be used as ribs for a skin that will contain the cell volume. The technique is commonly used in 3D modelling. This approach has the advantage of simplicity, and proves very useful for poor datasets. (ii) Since the regular shapes of the cells are known, one could add penalties for asymmetric extensions produced during dilation, and add appropriately weighted erosion steps. This can improve the reliability of segmentation. (iii) Finally, thresholding could be used to describe the entire extracellular space, marked by labelled cell wall material. Cells would appear as holes, and size and shape limits could be used to constrain the automatic segmentation of numerous cells within the dataset. Deformable model based segmentation techniques have proved very useful in medical imaging, e.g. CT and 3D ultrasound measurements. Given the simple geometry of plant cells, there is a obvious application for these methods in the automatic 3D segmentation of entire plant embryos or meristems. Further, with the development of more robust segmentation methods, automated 4D tracking of developing cellular architecture in living tissues becomes a real prospect. This section of the website describes our attempts to develop improved computational methods for the analysis and modelling of cell-cell interactions within plant meristems. 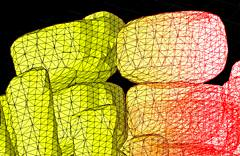 Faster and simpler methods are needed for the conversion of 3D microscopic data to a form suitable for numerical modelling, and this leads to new ways of using real biological data for building and testing dynamic models of cellular development. Developing multicellular tissues or organs generally demonstrate a capacity for self-organisation. For example, wounded tissues generally respond in a robust and coordinated fashion to allow repair, and local induction events can initiate prolonged and coordinated developmental processes (such as in limb bud formation). These types of developmental plasticity and functional autonomy are particularly evident in plant tissues. The basic features of a plant's body plan are established during embryogenesis, however its final form results from the continued growth of meristems and the formation of organs throughout its life, often in a modular and indeterminate fashion. Plant cells are constrained by rigid cell walls and are generally non-motile, so there is the clear possibility that cell fates within a meristem are determined by lineage. However, evidence from plant chimera and wounding studies have demonstrated a more important role for cell-cell interactions during fate determination. It is likely that positional information during plant development is obtained via cell-cell contact, and that the coordination and fate of cells within a developing meristem may be determined by a network of local cellular interactions. It is likely that intercellular communication plays a coordinating role in the development of all multicellular organisms. We have chosen the Arabidopsis thaliana root meristem as a model system for investigating intercellular interactions. The Arabidopsis root meristem provides an ideal model system for probing plant cell interactions. Arabidopsis is highly amenable to conventional and molecular genetic approaches and the sequence of the entire genome is complete. The Arabidopsis root meristem has a simple and regular architecture; the tissue is transparent, and its development can be observed by microscopy. The main aim of our work is to better understand the way positional information is exchanged between cells during plant development. We are developing two main approaches to this subject. In order to dissect local cell-cell interactions it is crucial that we can (i) clearly visualise individual cells inside living meristems and (ii) have the means to manipulate them. Accordingly, we have developed new optical and genetic tools which allow precise misexpression and 3D visualisation of gene products within living cells of intact Arabidopsis plants. Confocal microscopy allows the collection of 3D datasets, as a stack of optical sections can be collected by altering the position of the focal plane and collecting successive images. The motorised focus of modern microscopes can be stepped at very small increments (e.g. Leica RXA can produces steps down to 40nm). We tend to use increments around 100-200 nm. The datasets comprise a series of X-Y axis optical sections that form a stack in the Z-axis dimension. 3D visualisation software can treat this data as a large (up to 200MB) matrix, and provide various algorithms to allow slicing, excavation, marking, isosurfacing, volume segmentation and 3D rendering of features within the data. This type of computer analysis and rendering allows (i) the abstraction of labelled structures within the 3D volume. For example, individual cells can be segmented, surface rendered and colour coded. 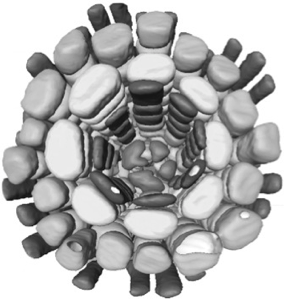 So cells that might have corresponded to several million voxels (volumetric pixels) in the original dataset can be abstracted and visualised as a single object. This object is more biologically relevant and, once defined, (ii) the 3D arrangements of these objects can be easily visualised. The display, colouring and transparency of individual objects can be adjusted to highlight features of interest, deep within the dataset. The labelled tissues can dissected virtually, cell-by-cell, and be scaled or viewed from any angle.